Mountain Construction claims to create art you can live in. 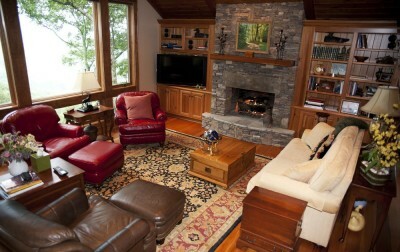 "Well, it's true," boasts homeowner Bill Hunter about his mountain home atop Yonahlossee. 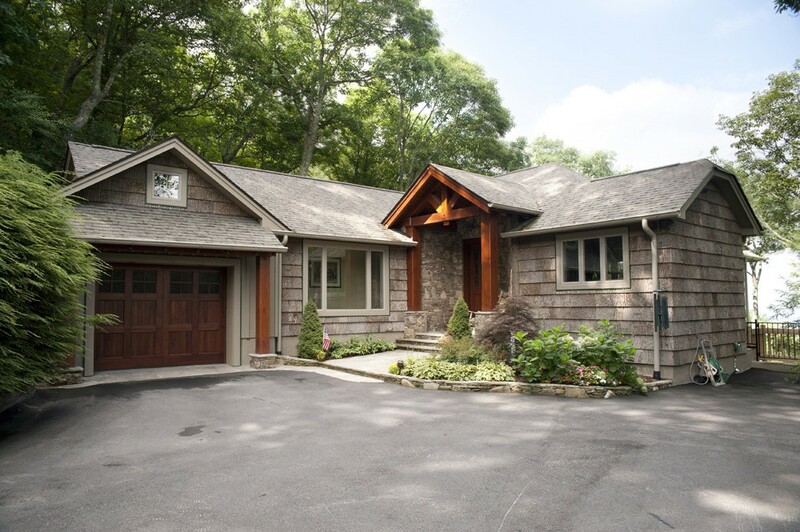 One can verify this claim simply by looking at the outside of the home, adorned in natural bark siding, stunning stacked stone, and without a nail used on this impressive front porch. 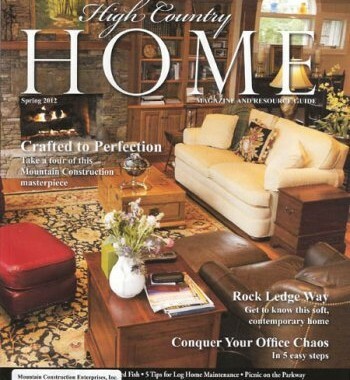 Mountain Construction was the first timber frame company in Watauga and Avery Counties, and they have been part of the remodeling market in Blowing Rock and Banner Elk for over 20 years. 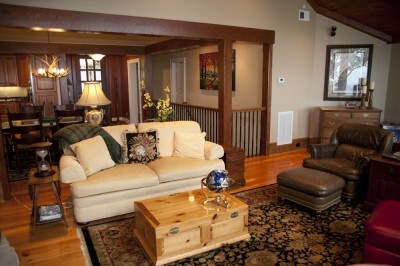 Mountain Construction enjoys working with remodels because they are a form of creative, sustainable building. For the past three years their work has been about 50% remodels. Mark Kirkpatrick, owner of Mountain Construction, and project manager Nick Hurst, worked very closely with the homeowners to turn the plain Jane home into something fantastic. From the moment one enters through the two wooden pillars encasing the heavy front door--which stands an exceptional eight feet tall and three and a half feet wide,--it's obvious that this home is something spectacular. Although they did not tear the original structure down, homeowners Bill and Sharon Hunter essentially started from scratch. They liked the floor plan and fell in love with the view, but knew that there were many improvements that could make this home truly impressive. 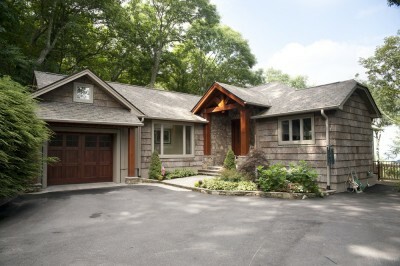 The home at Yonahlossee was a "golf course" style home with a hip roof (in which all sides slope downwards to the walls) and traditional siding. Bill and Sharon Hunter, builders and developers from Wilson, NC, knew the true potential of the house. Bill had some drawings done that created a contrast with mountain textures such as poplar bark, stone, shakes, timbers and other natural elements that he wished to include in his mountain dream home. The entranceway into the home features tongue and groove walls layered in a deep red tone, giving off a warm cabin atmosphere. The gorgeous wooden floors, constructed of reclaimed heart pine timber from a cotton mill in Bill's hometown, are carried throughout the open first level in the kitchen, living room and dining area. Extensive work was done on the kitchen, namely to the four feet of space added on, making it more functional while also incorporating the Hunters' individual design style. 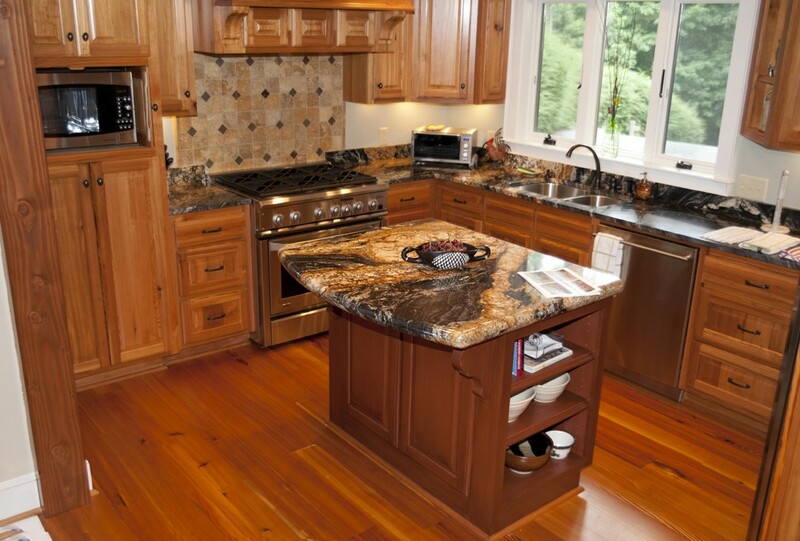 The double slabs of granite found on the island are an extremely unique addition, with thick, rounded edges and large splashes of black, brown and white tones. Beautiful pottery done by the Hunters' daughter is proudly displayed throughout the kitchen and the rest of the home. The tan tile backsplash and lightly tinted cabinets make for a stylish, modern ambiance while the large beams and posts surrounding the eating area continue with the mountain-cabin feel. The dining table, dating back to the 1840s, is a true family gathering place that is full of tradition, as the Hunters' children are the fourth generation to share a meal on it. Wherever the table is, that is where the family gathers for Thanksgiving--and now that it rests at this gorgeous mountain retreat, the Hunters have much to be thankful for. The living room is the obvious showpiece of the home, with one of the most astonishing views you can find in the High Country. During the remodel process, tearing off the old roof, reframing it, and putting in a wall of windows opened up this view. The dry stack stone fireplace is an impressive work of art, especially after understanding all that went into creating it. The previous fireplace had simple stuck-on stone, so the hearth was brought out in order to place the new stones in, and a steel I-beam was inserted to hold it all in place. 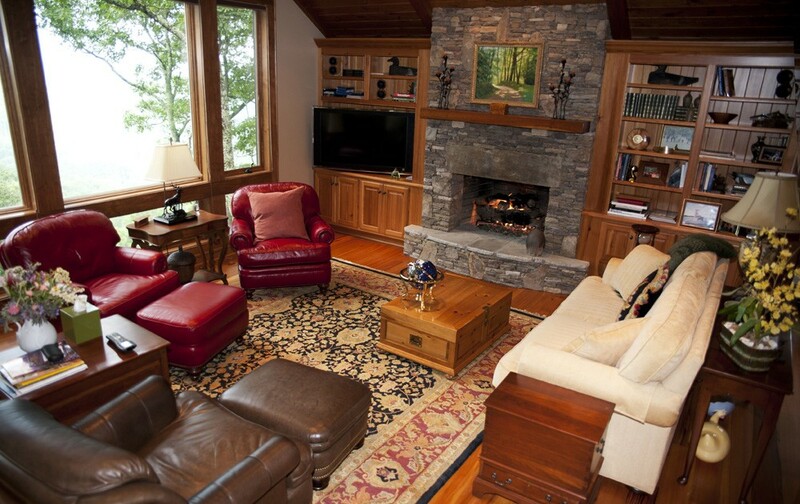 Mark turned this room into the Hunters' favorite space in the house, one that they could spend all day in, as Sharon explains, "We gravitate toward the living room. When you're in it, you're stuck." By adding the gable glass framing to complement the new vaulted ceiling, Mark created a very distinctive space with a completely different view. Although well worth it, this process was quite an endeavor, as the scaffolding was nearly 40 feet off the ground, and the 1,800 pound window had to be brought over the house and inserted into the hole using a boom truck. Many exceptional design features give this room its elegant yet comfortable feel, such as the local spalted maple log coffee table, which the Hunters bought on a whim and had sanded down to make it a functional table. Off the living room, doors open to the partially covered deck where the views are absolutely astounding. Adjacent to Moses Cone, the thick forest allows for a private space from which to sit and watch the clouds settle over Hanging Rock and Beech Mountain. 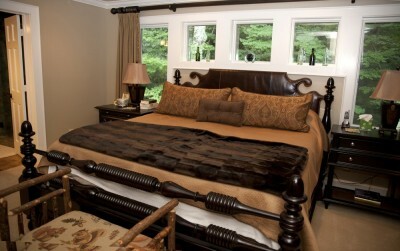 The master suite is a very attractive room with chic furniture in darker tones and a tray ceiling, all of which creates an atmosphere of space and comfort. Three small box windows are carved into the wall behind the bed, bringing in soft natural lighting. And if the Hunters need one last glimpse of that beautiful view of the mountains before going to sleep, a door from their room walks out onto the porch. The bathroom features granite vanity tops, beautiful stone in various neutral colors on the shower walls, and river rocks embellishing the shower floor. A window placed in the shower provides a beautiful view of the blooming rhododendron in remarkable shades of pink and purple. One more bedroom lies upstairs, coated in a stylish coffee color with French doors opening to an outdoor patio. The hall bath is buzzing with dragonflies and grasshoppers, as adorable mountain critters adorn the shower tiles. One cannot help but notice the impeccable design style found in every room of the Hunters' home, which was carefully crafted with the help of Jennifer Patusic of Signature Interiors (who helped with everything from bedding to furniture to paint choices). One thing that the Hunters knew they wanted to create was a much more open floor plan, and one place where this is evident is the stairwell to the lower level, which was knocked out and made completely open. The downstairs holds two more bedrooms, the first a very modern, feminine space with purple walls and a bright green bedspread. The three large windows lining one wall allow a cool breeze to ruffle the light curtains and draw one to the tranquil mountainous scene beyond. The fourth bedroom is decorated with contemporary shapes and patterns, has a large bed, and has access to the downstairs deck with the same astounding views seen in the rest of the Yonahlossee home. This was a large and complex project to take on, but when the remodel was completed, the Hunters ended up with their dream home. 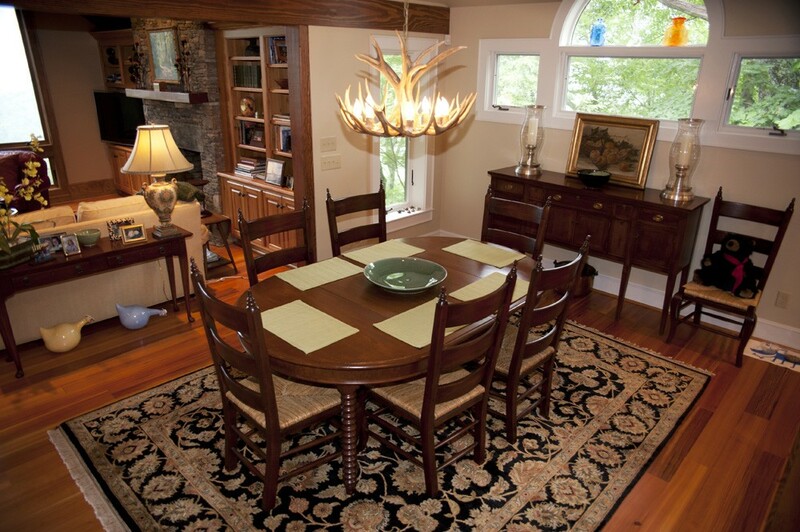 The trick in remodeling is to make the renovations look as if they have always been a part of the home. Master craftsmanship may be a dying breed, but this home is a visual representation that homes can still incorporate fine detailed work from the stacked stone fireplace to the cathedral ceilings to the wooden beams. The Hunters do not wish to change one thing about their home and are extremely grateful to Mark and his crew for their impeccable communication and diligent work. For construction and preconstruction consultation services or more information about Mountain Construction, visit their website at https://mountainconstruction.com/default.htm or call (828) 963-8090.